Last Sunday I decided to try out a new hashtagging strategy on Instagram. First, here's a screenshot of my Instagram posts for the past week. I'll be revealing the results for each post below, starting with the one on Sunday. This new hashtagging strategy involved carefully researching and selecting targeted hashtags to use with each of my Instagram posts. I had 2 sets of 30 hashtags that I alternated each day. The goal was to get some of my posts to trend in the top 9 posts for any one of these hashtags. The strategy DEFINITELY worked as you'll see from the results that I will share with you below. 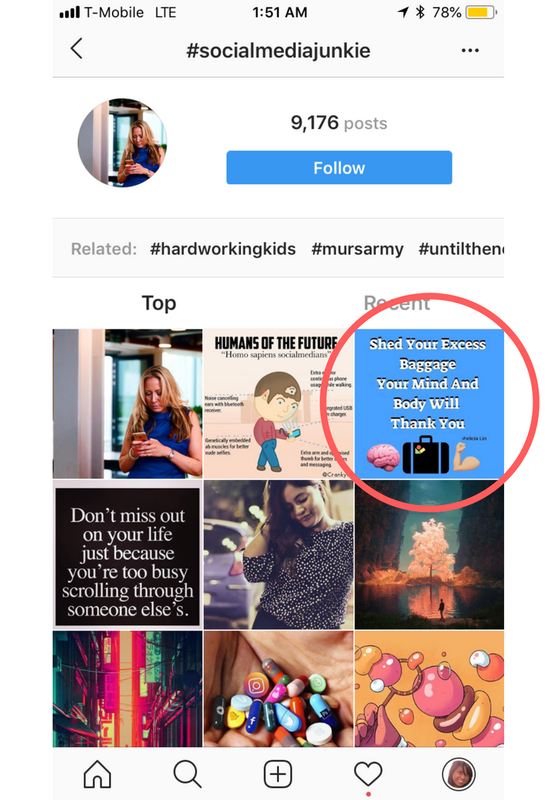 NOTE: I am only showing you the posts that 1) ranked in the top 3 posts for hashtags with 1,000 or more posts, or 2) ranked in the top 9 posts for hashtags with over 10,000 posts. My posts also did well with smaller hashtags (i.e. ones that have less than 1,000 post), but I'm not sharing those here. 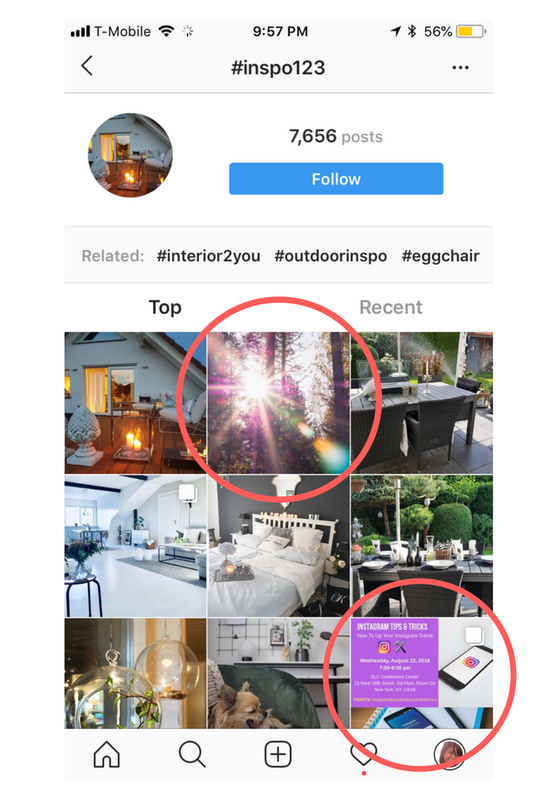 *If you want to cut to the chase and read my 3 Tips For Hashtagging On Instagram, scroll down to the bottom of this post. 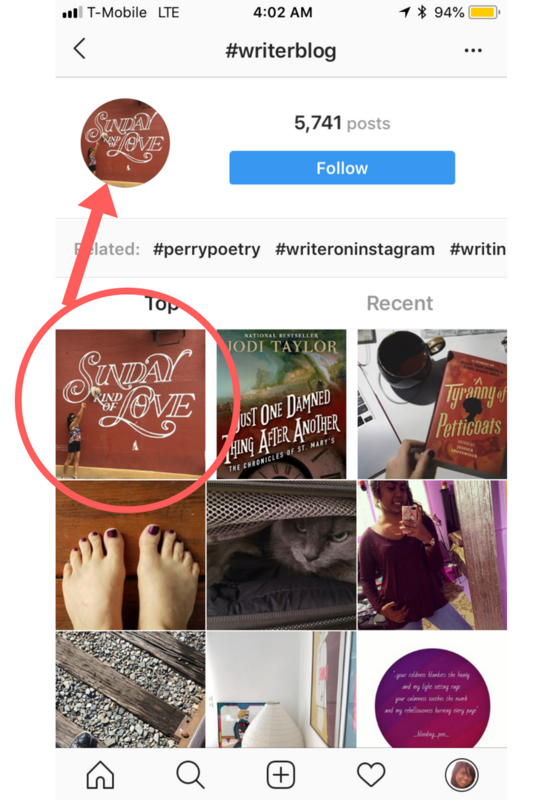 Click through to see where the "Sunday Kind Of Love" post ranked in the top 3. 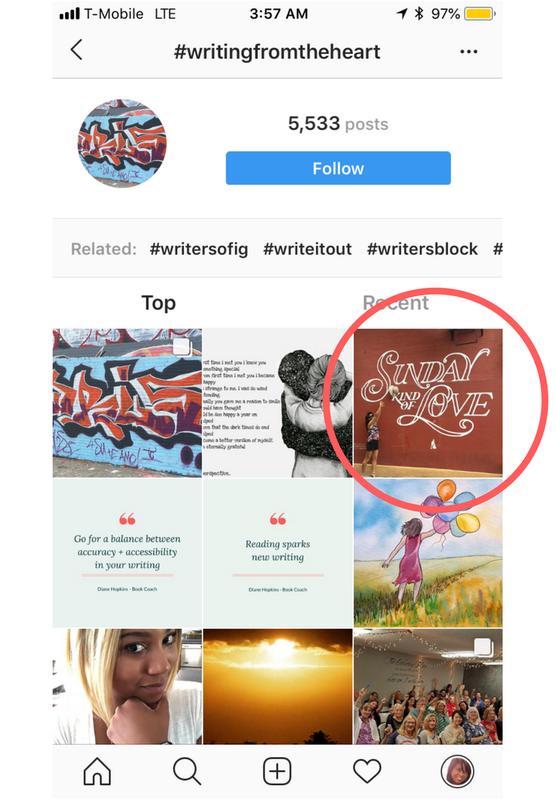 Click through to see where the "Sunday Kind Of Love" post ranked in the top 9. Click through to see where the "Shed Your Excess Baggage" post ranked in the top 3. Click through to see where the "Take It One Step At A Time" post ranked in the top 3. Click through to see where the post about my upcoming Instagram Workshop ranked in the top 3. Click through to see where the post about The Taiwanese Bubble Tea Festival in New York City ranked in the top 3. Click through to see where the post with a Social Media Tip of the Week from Rebekah Radice ranked in the Top 3. Click through to see where the post about gratitude ranked in the Top 3. Click through to see where the post about gratitude ranked in the top 9. As mentioned, there is quite a bit of research and prep work involved in order to get the right hashtags before even implementing this hashtagging strategy. It's too involved to explain here in detail. Besides, you didn't expect me to just hand it all over to you on a silver platter did you? I could teach a workshop just on this particular hashtagging strategy, and if there's enough demand for it, I just might do it. Do some research and use hashtags specific to your niche, industry, expertise, or subject matter of the post. You are allowed to use up to 30 hashtags per post, so use ALL 30. Include only 3 hashtags in your caption so that it looks less cluttered. Then immediately put the rest of the hashtags in the first comment of the post. 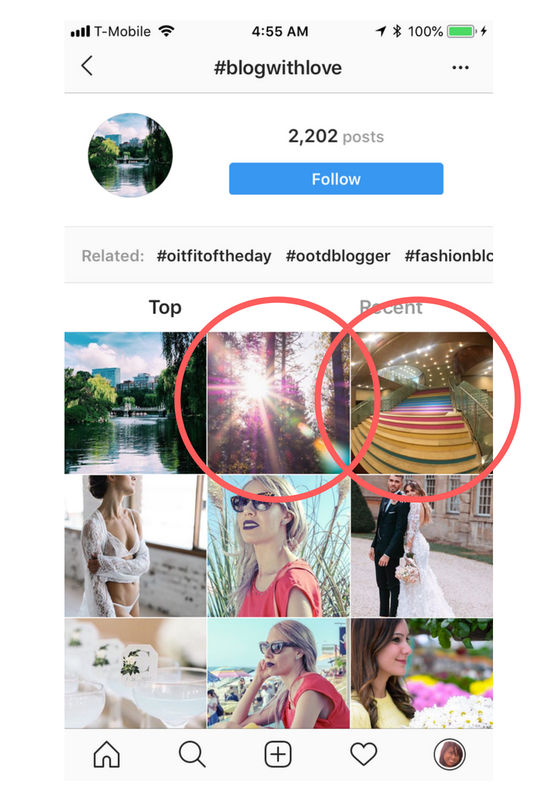 BONUS TIP: Tag the location and other relevant Instagram accounts in your posts. 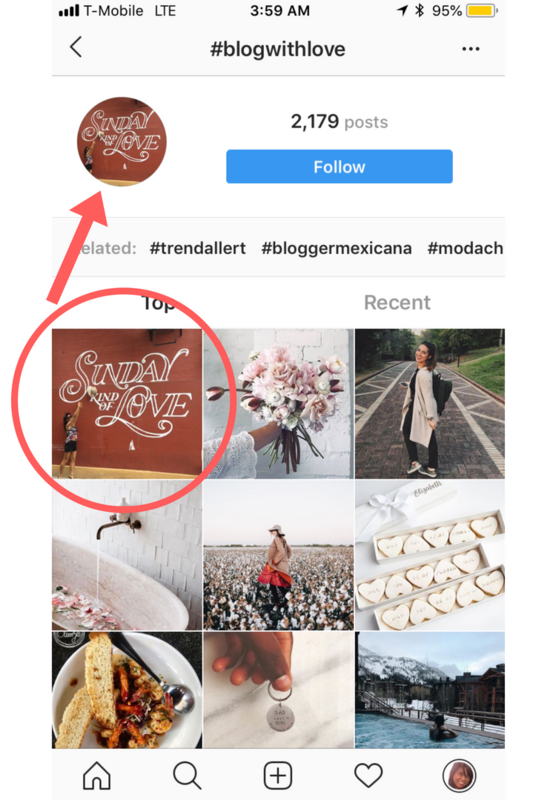 Ranking in the top 9 posts for various hashtags in your niche, is a great way to gain exposure and to grow your following on Instagram! This method requires consistency and patience. Since implementing this new hashtagging strategy, I've noticed that right after posting, my posts don't always immediately get a lot of likes. However, within 24 hours it picks up and I do end up getting the expected number of likes on my posts. There is another piece to this strategy- engagement. More on that in a future blog post. Sep 11 It's Time to Up Your Instagram Game!